For discount hotels, motels and serviced apartments in Darwin and the Top End look no further than Budget Stay. This unique site allows you to deal directly with a wide range of Darwin hotels and apartments and get quality accommodation at cheap, budget rates. So the next time you are travelling to the Northern Territory book your accommodation online to ensure you get the cheapest rates that are available for Darwin accommodation. The Alatai Holiday Apartments are ideally positioned in the heart of the Darwin CBD, providing affordable studio and two bedroom accomodation with a delightful combination of oriental flavour and tropical Darwin life style. By choosing to stay at the Alatai Holiday Apartments guests will be able to choose from a wide range of budget hotel rooms with discount rates available for longer stays. The central Darwin CBD location of this property means that it is within easy reach of many of city's major attractions, making it a great place to stay for corporate travellers and holiday makers. With a central location in the Darwin CBD business and holiday travellers who choose to stay at the Alatai Holiday Apartments will find themselves close to the beach, botanic gardens, Mindil beach night markets, casino and golf course, city mall, shopping centre, cinema, city attractions, nightspots and the Port of Darwin. The Palms City Resort provides a little touch of paradise in the heart of Darwin with the very best in corporate and leisure accomodation conveniently located on the picturesque Esplanade in the heart of the Darwin CBD. By choosing to stay at the Palms City Resort guests will be able to choose from a wide range of budget Darwin CBD hotel rooms with discount rates available for longer stays. The central Darwin CBD location of this property means that it is within easy reach of many of city's major attractions, making it a great place to stay for corporate travellers and holiday makers. With lots of interesting and exciting things to see and do in and around Darwin guests who choose to stay at the Palms City Resort will be well positioned to see them all. This budget property provides business and leisure guests with fully self contained apartments that are spacious and well equipped, as well as great hotel facilities that add to your accommodation experience. The Value Inn in Darwin is conveniently positioned close to shops, restaurants, hotels, nightclubs, casino, tourist attractions and nightlife entertainment. Ideally situated in a great city location the Value Inn is within easy reach of all the major attractions that Darwin has to offer. This along with the many guest facilities like lounge bar, business centre, disabled facilities, faxing facilities, free car parking, guest laundry, lift, spa, outdoor swimming pool, tour desk, bbq facilities, landscaped garden, security, 24 hour reception and daily housekeeping is what makes the Value Inn such a great place for a relaxing stay. With convenient access to everything around Darwin due to its central location the Value Inn offers travellers a range of hotel accommodation that is near everything that Darwin and the surrounding region has to offer. The Mediterranean All Suite Hotel in Darwin provides travellers with the variety of luxury suites or delightful hotel accommodation, at very affordable, budget rates. Located close to everything that Darwin has to offer, including the CBD and Kakadu National Park, the Mediterranean All Suite Hotel is sure to make your next stay in Darwin both enjoyable and relaxing. The Mediterranean All Suite Hotel provides easy access to all of the major business and tourist attractions in Darwin, which is what makes it the perfect self contained apartment accommodation in the Darwin CBD for your next stay in the city. The property also features numerous guest services and facilites such as disabled facilities, faxing facilities, free car parking, guest laundry, lift, secretarial services, outdoor swimming pool, tour desk, security, baby cots available for families and daily housekeeping. The Mediterranean All Suite Hotel is situated within close proximity to the many of the major attractions around Darwin including the Mindil Beach Markets, Darwin Golf Course, Botanical Gardens, Aquascene fish feeding, Crocodylus Park, city shopping and Casuarina Shopping Mall. The City Gardens Apartments Darwin is a small group of two bedroom fully self contained apartments on ground level and 1st floor all overlooking a lagoon style swimming pool with BBQ area and short walk to city centre. The City Gardens Apartment Darwin provides easy access to all of the major business and tourist attractions in Darwin, which is what makes it the perfect self contained apartment accommodation for your next stay near the CBD and the inner city suburb of Parap. The property also features numerous guest services and facilites such as free car parking, guest laundry, outdoor swimming pool, tour desk, bbq facilities and even a landscaped garden. The City Gardens Apartment Darwin is situated within close proximity to the many of the major attractions around Darwin including the Darwin City Centre, Water Front restaurants, museums, art galleries, fish feeding, sunset cruises and Mindle Beach Markets. The Cullen Bay Apartments in Darwin provies a variety of hotel rooms, as well as 1 & 2 bedroom self contained apartments that are ideal for the corporate and leisure traveller alike. 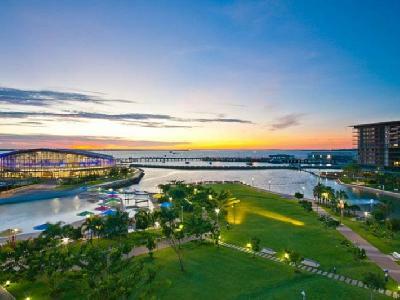 They overlook the magnificent Cullen Bay Marina with a superb view of the Darwin City, the harbour, the Timor Sea and nearby parklands. The Cullen Bay Apartments provides easy access to all of the major business and tourist attractions in Darwin, which is what makes it the perfect self contained Cullen Bay apartment accommodation for your next stay in the city. The property also features numerous guest services and facilites such as conference centre, direct internet access, faxing facilities, free car parking, guest laundry, lift, spa, outdoor swimming pool, tour desk, bbq, airport shuttle, 24 hour reception and baby cots available for families. For a long time business and leisure travellers have been staying at the Cullen Bay Apartments because of its unique home away from home feeling. Also the friendly and knowledgeable staff and excellent array of facilities at these Darwin CBD apartments will ensure that your stay in the city is completely trouble free. The Best Western Darwin Airport Gateway Motel offers budget Darwin Airport hotel accommodation located just minutes from the Darwin CBD and the airport. Whether your visit is for business or pleasure the Best Western Darwin Airport Gateway Motel will let you choose from a wide range of budget hotel rooms with discount rates available for longer stays. The central Darwin CBD location of this property means that it is within easy reach of many of city's major attractions, making it a great place to stay for corporate travellers and holiday makers. With easy access to everything in Darwin and the surrounding precincts because of its central location the Best Western Darwin Airport Gateway Motel offers travellers a range of hotel accommodation just a short distance from the Mindil Markets, Litchfield National Park, Kakadu National Park, Marrara Sports Stadiums, Cullen Bay, Crocodylus Park, Fannie Bay Gaol, Museum and Art Gallery of the Northern Territory and Aquascene.